Area served:USA, Canada, Australia, United Kingdom, France, Italy ect. Mpwh.com claims to be the number one herpes dating site in the world. With a healthy membership base of around 80,000 members from across the globe, there is absolutely no doubt about the fact that this is one of the largest communities for finding and dating herpes positive singles from all over the world. 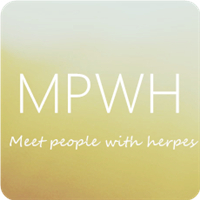 MPWH stands for “Meet people with herpes” and the website certainly delivers to the promise. The website has a decent track record bringing together people from all walks of life to a common platform, where they can discuss about their issues the face and find solutions together. Apart from being a dedicated herpes dating site, this platform also has plenty of information related to herpes and ways to deal with them in the most effective way. The website specializes in connecting people for a long-term relationship and doesn’t promote casual dating and encounters. ·Create a profile with lifetime validity. ·Fill your personal details as well as objective information related to interests / hobbies. ·Get in touch with like – minded people without having to reveal your true identity. ·Add photos and answer questionnaires given by the website. ·Send winks to let others know that you're interested. ·Standard users can use the quick search option. ·Check out who has sent viewed your profile or sent winks from the ‘my hits’ section on the website. ·Favorite people whom you're interested in or block those whom you don’t wish to connect with. ·Easy process of profile verification that takes less than 24 hours. ·Upgrade to premium membership by paying subscription charges as stated above. ·FAQ and technical support that is available 24/7. ·Access to advanced search options that includes parameters such as horoscope, interests, hobbies, zip code and relationship status, among others. ·Access to a wide array of privacy options using which you'd be able to control access to every part of the profile. ·Become a certified member of the website. ·Check out informative articles pertaining to sexually transmitted infections and their probable treatments. ·Get in touch with a counselor or dating expert in order to learn about the tips and tricks of online STD dating. Mpwh.com is certainly a one of its kind website. But it doesn’t have a webcam chat option. Looking at the increasing number of websites in this segment, we feel that this addition would certainly change prospects for this website. With a membership base of over 80,000 people from across the globe that have been infected with the herpes simplex virus, finding an ideal match shouldn’t be a problem. The website also has a unique option using with you can earn a month’s premium membership without having to pay a cent. All you need to do is deliver a revolutionary idea that can make the site better. The website is easy to use and even amateur users wouldn’t face any issues accessing the various options available on the site.